Hey, guys! Happy Cinco De Mayo! I reallly wish I could celebrate by sippin' on some margaritas today, BUT that's not going to happen with this preggo! Haha! 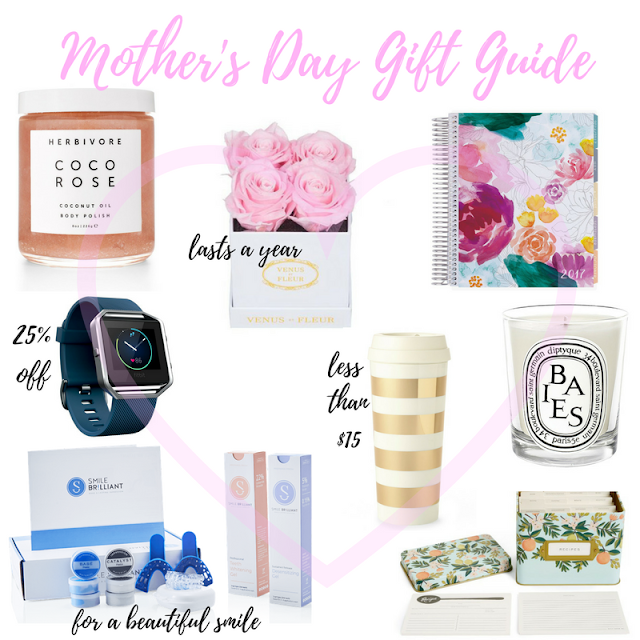 I wanted to get a Mother's Day Gift Guide up to help with some gift ideas for that special mom in your life or if you want to do a little shopping for yourself! Ok Y'all! I have this stuff and use it every single night! I'm getting close to finishing my second container of it! It's a gentle scrub that you apply in the shower (I use it towards the end), and it leaves your skin so silky smooth. You don't even have to use lotion when you get out. I suffer from keratosis pilaris that gets pretty bad when I'm pregnant (especially on the back of my arms and thighs), and this has significantly reduced it. That's another reason why I will never stop using it! Okay, so this is definitely on my wish list. I've always wanted these. These real roses last up to a year and come in so many beautiful color options. I live for fresh flowers in our house! And instead of giving your mom flowers that are going to last a week, why not get her flowers that last 365 days! Winning! For that mom that has a million things going on (like my mom), this would be the perfect gift to help her stay organized. I have one of these planners because I just wanted to see what all the hype was about and I'm obsessed! Right now you can get your mom a FitBit Blaze for 25% off! I love mine! My husband and I always have competitions on who gets the most steps each day. You can also get really cute bands online like these for 15 bucks that come in a million colors! How cute are these mugs! In my opinion, you can never have too many of these so you can take your coffee with you where ever you go! And at that price...might as well get one for yourself too! OMG these smell soooooooo good! Another item you can never have too many of...candles! I always have 1-2 candles burning in my house every day! Definitely, could use another one of these...hint, hint hubs! Okay, how cute is this little recipe tin! I'm pretty sure I'm going to get this for my mom so she can write down all her recipes and give it back to me! Haha! This is such a unique and perfect gift for mother's day! I mean, who wouldn't want a whiter smile! I have a dedicated blog post with my before and afters here and I absolutely LOVE this system! I love that the teeth whitening gel is vegan and cruelty-free and that the trays are custom fit to your teeth! Smile Brilliant was kind enough to offer my readers $25 off a teeth whitening system!! Well, that about does it! I hope you guys a great weekend!